Iotspot asked Kommerkors to design a device that assists the modern office worker to find a workstation. The device uses The Internet of Things (IoT): a device is built into the worktop that is connected to the Internet. Using an app on his or her mobile phone, the employee sees at a glance which workstations are available and can already reserve them. 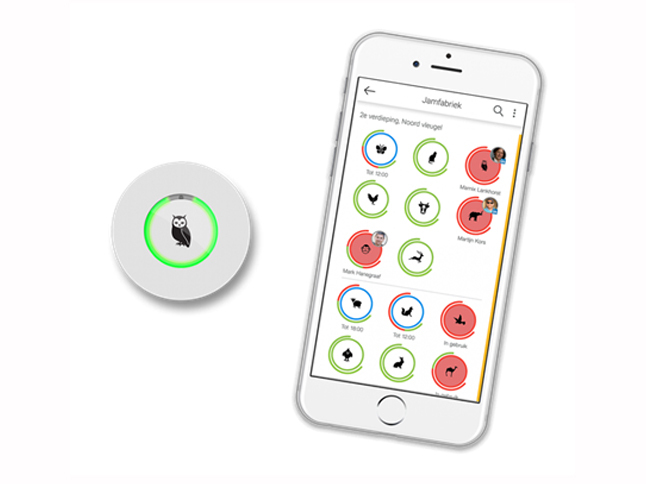 The design clearly shows how Kommerkors, working together with iotspot, pays attention to sustainability. Iotspot strives for sustainability in its products. In this first phase, the focus is on minimal environmental impact during production and creating the opportunity to make components of the device suitable for re-use at the end of its useful life. That’s why well-considered choices have been made for the materials used, the production process and in the design. The decision was made to concentrate the majority of the production and assembly in the Netherlands. Doing so will ensure that European environmental directives are complied with as much as possible. One example is the Restriction of Hazardous Substances directive (RoHS), which limits the use inter alia of lead, mercury and cadmium in electronic equipment for the European market. But other environmental legislation relating inter alia to waste products and energy saving also make production in the Netherlands more sustainable than elsewhere in the world/low wage countries. The iotspot housing is made of ABS (acrylonitrile-butadiene-styrene), from which, inter alia, Lego is also made. Apart from its aesthetic qualities, this material also has many durable properties. In production, it has a high degree of dimensional stability, which results in low losses of raw material due to malformation. It is also impact-resistant, so it does not break easily. Moreover, it is easy to recycle and can be easily converted into new products after use. The window in the middle is made of PC (polycarbonate). Among other things, this plastic is used for safety glazing and motorcycle helmet visors. This choice was made because this plastic has good UV resistance and is very colourfast, which increases its useful life, especially when installing the iotspot near windows. In addition, just like the ABS housing, it is highly impact-resistant and easy to recycle. In order to facilitate re-use, the materials need to be as homogeneous as possible. For that reason, the plastics we mentioned are not mixed, no composites are used and the various materials used in the housing can all be separated from each other. When designing the various components of iotspot, consideration was given to the principle that the product should be capable of being easily and properly recycled. Apart from choosing sustainable and homogeneous materials, we also ensured that the individual components could be removed and replaced. By using screw connections instead of a click system, an iotspot can also be partially renovated in case of damage. What’s more, the images/icons on iotspot, for example, are not printed on the housing, but have been added as a separate component. As a result, the material of the housing does not become contaminated by ink, lacquer or glue. With a view to a more circular economy, iotspot has set itself the goal for the future of producing products exclusively from raw materials recovered from discarded products. To this end, a returns system was initially set up: all iotspots are taken back by the producer after use, so that the raw materials can be separated and reintegrated into the production chain. Apart from the straightforward use of materials, it is therefore also necessary for the different materials to be clearly recognisable. For the iotspot, work is in progress on setting up a "raw materials passport". The idea of such a passport is that if you want to efficiently bring raw materials back into circulation, this will only succeed if they are clearly recognisable in the products. Such a passport will contain data on: what materials have been used in the product, how much and in what composition. To the extent possible, the iotspot components will also be given material codes in the future, so that the different materials can be clearly identified.